Though his fascination with music has been lifelong, Jon Gerler's musical existence as DJ FM is a journey that began over fifteen years ago. Following the dissolution of his band S.G.O. in 1997, Gerler and producer Tom Mohbat began work on DJ FM's debut EP "breakup." The album introduced FM's signature blend of danceable beats, world percussion, live instrumentation and the haunting vocals of singer/actress Elizabeth Fountain. Tracks from the album were featured on MTV's "Real World," "Road Rules," and the Abercrombie & Fitch website. The song "Baranquilla" appeared on the Record Exchange's 1999 "Notes from Home" compilation CD which led to significant regional airplay on college radio, as well as a mention in CMJ. FM then began his most ambitious plan to date: moving his music out of the clubs and assembling a group of musicians to help him perform in a live setting - The FM Initiative. Enlisting the aid of S.G.O. 's drummer Jason Clevenger and Mohbat's alter-ego Ravi on percussion, FM played a series of local live dates, including a benefit performance at Club Metro in Asheville and the Freakadelic Records Freak-for-All in 2000 at Local 506, Chapel Hill. The group took a hiatus following FM's move to Baltimore, Maryland, where he began focusing on honing his DJ-ing skills, as well as the completion of his second EP, "conversion.factor". He DJ-ed at small clubs in and around Washington D.C., including the Galaxy Hut and Clarendon Ballroom in Arlington, VA. "Conversion.factor" was released online in early 2001 through a fledgling website called mp3.com, and 2AM Artist Management's Keith Haas invited FM's live group to perform at 2AM's Artist Showcase in Springfield, MA before an audience of over 2,000. Back in North Carolina, FM began work on his 3rd release, the "Land on your Feet" EP. Tracks from all three of his releases continued to be used by MTV as well as various PBS programs including "In The Mix," and online indie retailer The Orchard helped the "breakup" EP see distribution through Apple's hugely successful iTunes Music Store. Along with former Resonance Project DJ Tom Foolery, HiJinx Records was founded and FM began a year-long Friday night residency at Rush Lounge, formerly the center of Raleigh's up-and-coming South Glenwood district beginning in 2004 (now the Pourch and The Bassment). 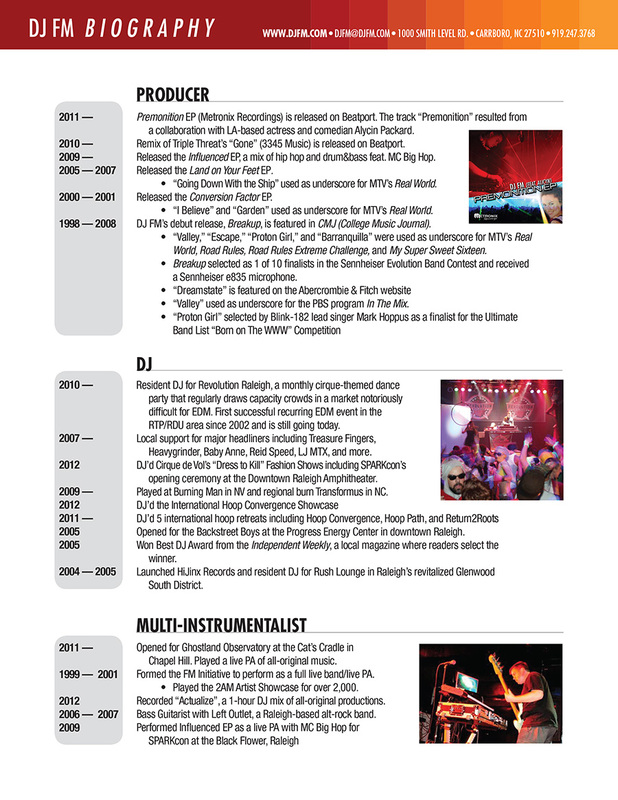 After concluding his residency at Rush in early 2005, guest appearances at Aries Lounge, Oliver Twist, Talulla's, and a high-profile gig opening for the Backstreet Boys at the Progress Energy Center followed. 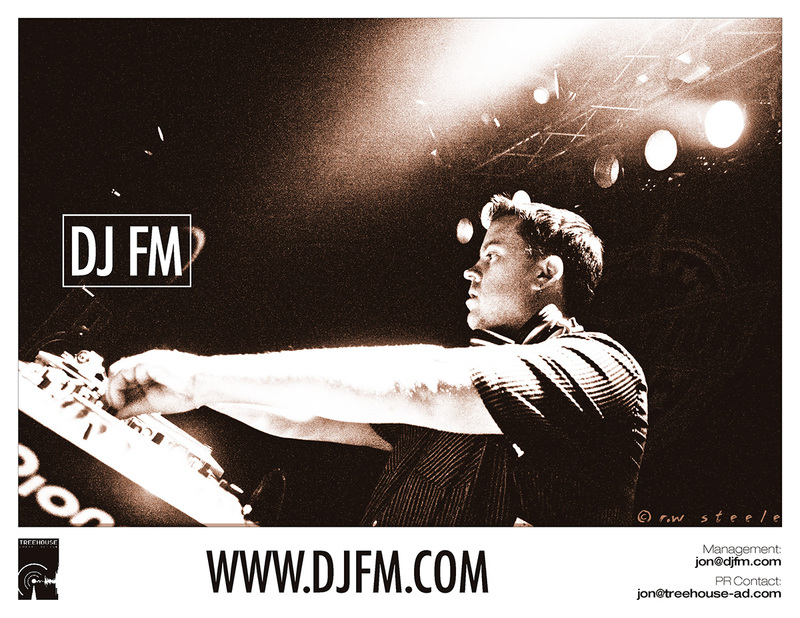 For this he was voted as Best DJ in the Triangle for 2006 by the Independent Weekly. 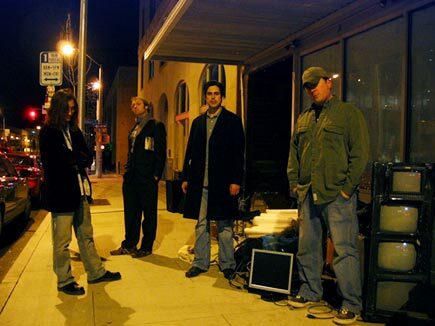 From 2006-2007 he then played bass/keys for local Raleigh rock heroes Left Outlet, whom Grammy-nominated producer John Custer (DAG, Corrosion of Conformity) called "the best band to come around in a long time...great vocals...great song writing." FM then returned to DJ-ing in 2007, where he held down a summer-long residency at Glenwood South wine bar April & George and a 2-month residency at Chapel Hill's Mansion 462. Countless guest appearances at Chapel Hill's Vespa, Raleigh's Mosquito and Ess Lounge (as opening act for Fools Gold Record's Treausre Fingers), GruvGlu's EmergeNC 2008, Transformus 2009 and even a gig at AutoSub at Burning Man 2009(!) followed. 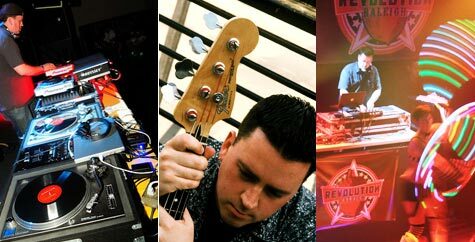 In 2010 FM began his residency for Lincoln Theatre's REVOLUTION Raleigh dance party, averaging 400+ attendees in a notoriously difficult maket for electronic dance music. 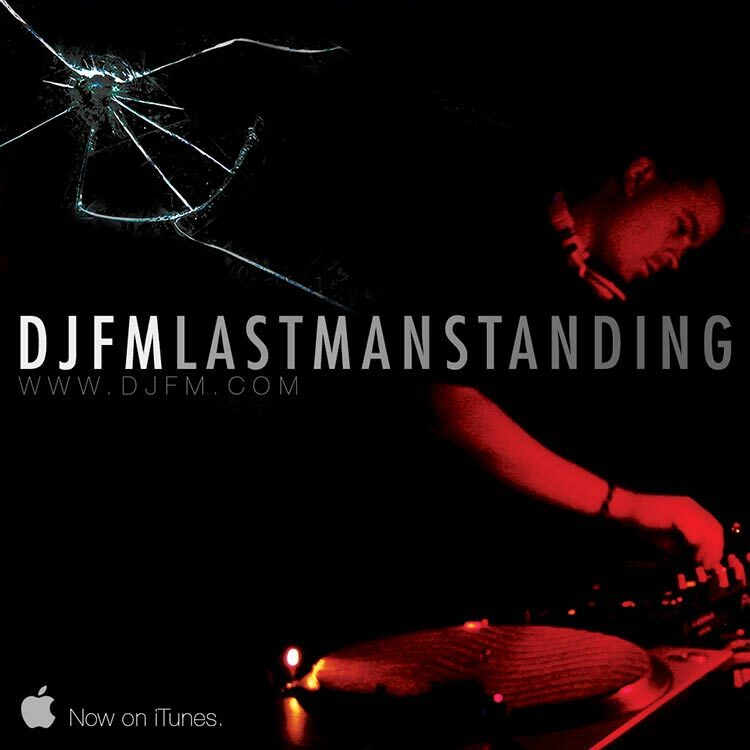 Yet for all the publicity, DJ FM's first priority is the release of his FIRST foray into drum&bass and hip-hop, Big Hop + DJ FM's "Influenced" (now on: iTunes and: Amazon.com), as well completion of his anticipated solo release, Last Man Standing. Featuring a varied line-up of vocalists (including Cynthia Holliday and Alicyn Packard) and MCs, Last Man Standing is shaping up to be a genre-bending tour-de-force of electronic mayhem. Sure to be his most personal and in-your-face work to date, Last Man Standing is about courage in the face of turmoil, hidden love, keeping secrets, and longing. "It's about wanting something out of reach," says FM, "and coming to terms with the internal conflict that results."